*In response to requests from our players, we have instituted age restrictions for admission to Bingo. As of October 15, 2015, we no longer admit children under 8 years of age. Sodality Meeting ~ The Ladies Sodality will meet in St. Charles Hall on Sunday, May 7, following 10am Mass. 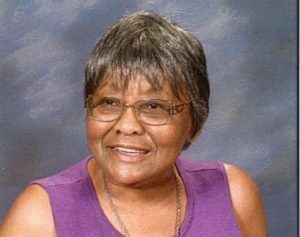 Agenda items will include May 13 Memorial Mass for Virginia Tapley and dinner options for closing meeting in June. In honor of Mother’s Day, please bring a picture of your mother or favorite mother-figure or a favorite photo of yourself as a mother. 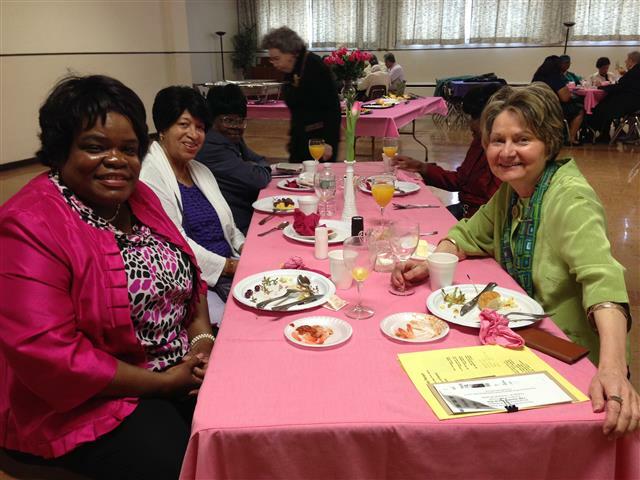 Prayer Partners ~ The CCCB’s annual Pot Luck dinner and opportunity to meet your prayer partner will take place on Thursday, May 11, at St. Columba-Brigid Parish. Please sign up on the sheets near the side doors if you are able to attend and bring a dish to share. For additional information, call Sr. Maureen at 716-897-9948 (x 114). Sodality Members are asked to assemble in church at 11:30am on Saturday, May 13, to recite the Rosary before the Memorial Mass for Sodalist Virginia Tapley. Mother’s Day Breakfast hosted by the men of our Holy Name Society is this coming Sunday, May 14, following the 10:00am Mass. All women of the parish are invited as guests of the Holy Name, but please remember that reservations are due by this Wednesday, May 10. They may be made by calling the Rectory Office at 716-833-0301 on Tuesday or Wednesday between 10:30am and 2:30pm. Non-parishioner adult guests, such as daughters, mothers, sisters, similar-in-laws, etc. are welcome. No children, please. Cost for a guest is $5 per person, payable at the door. Bible Study continues on Monday, May 15, at 7pm in St. Charles Hall. Please read from the booklet Genesis 1-11, God Makes a Start (pages 26-37); you may contact Fr. Victor if you need a copy of the booklet. Make sure to bring your Bible, and the Agape “A Guide for the Study of Sacred Scripture.” For additional information please contact Althea Porter at 716-316-8395. 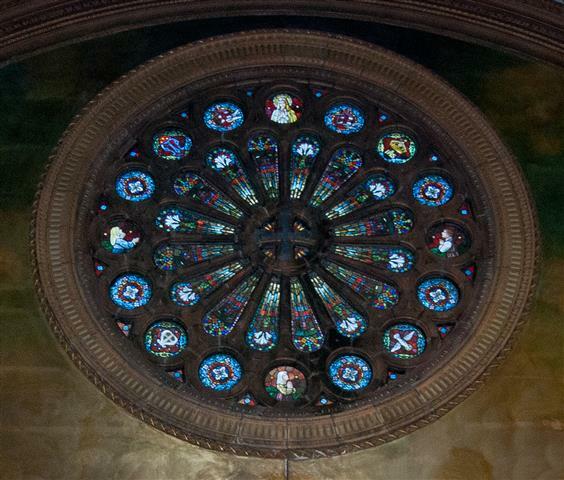 Volunteers needed for Sacred Sites Weekend ~ On May 20-21, Blessed Trinity will participate in the New York Landmarks Conservancy’s Seventh Annual Sacred Sites Open House weekend. We will join dozens of houses of worship all over the state showcasing their landmark buildings. It’s an opportunity to highlight BT as a perfect example of art preserved by faith and faith preserved in art. WE NEED VOLUNTEERS!! The Open House will take place on Saturday, May 20 from 2:00 to 4:00 PM (before 4:30 Mass), and on Sunday, May 21 from 12:00 noon (after 10:00 Mass) to 2:00 PM. We will need docents, greeters, sellers, and general hosts. If you have worked any of our Open Houses in the past, you know everything you need to do. If you are new to Open House tours, we will happily train you. If you can help on either of these two days, please fill out one of the forms on the Communion rail indicating what type of role you are willing to play and which date/time you are available. Place the completed form in the basket. Judy Casassa will contact you with confirmation of your assignment. Please sign up to participate by Sunday, May 14. Thank you!! Hope Award received by Blessed Trinity Parish from PeacePrints in recognition of contributions to Christmas Prisoner Gift Project. 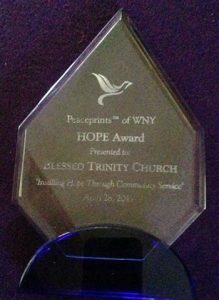 Blessed Trinity receives Hope Award ~ On Friday, April 28, PeaceprintsTM of WNY honored Blessed Trinity Church with its prestigious Hope Award in recognition of our many years of hosting and contributing to the annual Christmas Prisoner Gift Project. The presentation took place at the organization’s annual awards dinner held at Kloc’s Grove in West Seneca. PeaceprintsTM of WNY provides positive experiences for individuals in prison and former offenders transitioning back to the community. The Hope Award is given to a community partner who, through volunteers, donations and community service, instills hope in their residents and furthers programs for ex-offenders. Many of our parishioners have been active in this project, bringing in thousands of packages of hot chocolate, decorating bags, assembling donations, packing bags and boxes, loading trucks, etc. A sincere “Thank You” to everyone, especially Amy Johnson, who has coordinated BT’s efforts, in addition to filling countless pews with donated books. Special thanks go to Jan Burns, overall coordinator of the project, for her tireless and enthusiastic approach to continuing the legacy of Sister Karen Klimczak who initiated the prison project. In his closing remarks at the Awards Dinner, Father Victor assured the group that we look forward to continuing to host this wonderful program. Summary of April 19 Parish Council Meeting ~ Acknowledged John Curtin for his efforts in making Holy Week and Easter so special; reviewed Agape plans. The PeacePrints Hope award was announced, along with a date for outdoor assistance with planting by Buffalo Underground. Trinity Sunday (June 11) is being planned, and we look forward to a June 9 organ recital by William Maddox. Finally, a date is being determined for an upcoming “Bring a Friend or Neighbor to Church Sunday.” The next Parish Council meeting is Wednesday, May 17, at 7pm in St. Charles Hall. Anointing of the Sick ~ Beginning on May 21, there will be anointing of the sick and well-aging immediately after Mass. Anointing will continue on the third Sunday of each month. Please feel free to remain after Mass for anointing, and also invite those who are chronically ill or facing surgery and who would like to be anointed. “Garden Party” Set for May 24 ~ If you love to garden or just enjoy working outdoors, please mark your calendar for 6pm Monday May 24. A group of parishioners will be joining forces with volunteers from Buffalo Underground to work on sprucing up the church gardens. Rain date is June 5. Congratulations, Helen ~ Parishioner Helen Roddy Gray was honored at the YMCA Buffalo Niagara’s 165th Annual Meeting and banquet held at Statler City on Thursday, April 27. 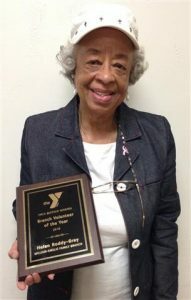 She was recognized for her many contributions as the 2017 “Volunteer of the Year” at the Y’s William-Emslie branch. 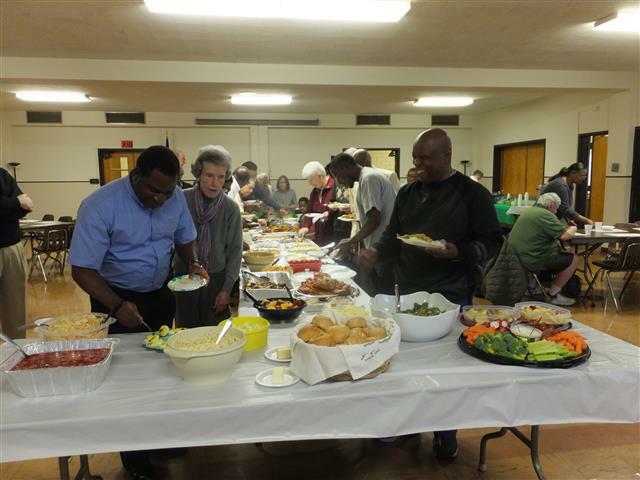 Parish Agape Feast ~ Thanks to everyone who attended our first Agape Feast on April 23, especially those of you who prepared food, helped to serve it, or stayed to assist with clean-up. We hope you had a good time and enjoyed sampling from the great variety of familiar offerings and new-to-you foods. Congratulations to Jack Curtin, this year’s recipient of the Lay Award of St. Joseph the Worker, as well as our bingo workers and members of the choir and finance council. They were presented with certificates by Father Victor in recognition of their dedication to the parish. Father Victor promises to honor additional parish volunteers at future events of this nature. Fourth Sunday of Easter: On this Good Shepherd Sunday, we celebrate the World Day of Prayer for Vocations. Pray for an increase in vocations to the priesthood, diaconate and religious life, especially for our diocese. May God raise up good shepherds in our midst. If God is calling you to a Church vocation, call Fr. Andrew Lauricella at 716-847-5535. You can also check out the “Priest of the Month” stories on our website www.buffalovacations.org. Slow Roll Buffalo ~ Join with other cyclists for Slow Roll Bi-weekly Monday Evenings. The group assembles for the first roll of the season on Monday, May 8 at Martin Luther King Park at 6:30pm and returns to that location by 8pm for an after-party. Please be advised that some streets might be closed to traffic during those hours as approximately 1,000 bicyclists roll through. Orange and black signs can be seen on some of the streets along the route. Please go to slowrollbuffalo.org to register and to learn more. We hope you’ll join us, whether on the ride or waving along the way! Protecting God’s Children Workshop for Adults (18+) ~ Wednesday, May 10 (1pm) at the Catholic Center of Buffalo. Call 895-3010 or email jacqueline-joy [at] ccwny [dot] org. Lutheran-Catholic Study Day (Reformation Anniversary Commemoration) ~ The Lutheran Judicatory of WNY and the Catholic Diocese of Buffalo are co-sponsoring an ecumenical study day on Friday, May 19, from 10:00 a.m. until 4:00 p.m. at Christ the King Seminary, 711 Knox Road, East Aurora, NY. Dr. Susan Wood, SCL, a member of the national Lutheran-Catholic dialogue, will keynote shared discussions of two recent anniversary statements, From Conflict to Communion (2013) and Declaration on the Way (2015). To register, contact Ms. Gayle Mann at 716-805-1438 or gmann [at] cks [dot] edu. Luncheon fee is $15.00. Looking for a way to get your kids off the couch this summer? St. Mary’s High School is offering summer camps for soccer, volleyball, and basketball players of all ages as well as for cheerleaders, runners, and aspiring leaders. Visit smhlancers.org or contact Brittany Heist at bheist [at] smhlancers [dot] org or 716-683-4824.